« Is the Mid-Major Era Over Already? The suit calls on the U.S. Department of Energy, Fermilab, the National Science Foundation and CERN to ease up on their LHC preparations for several months while the collider’s safety was reassessed. The LHC is hardly the first such particle collider, but don’t worry, Wagner thought previous efforts, such as the Relatavistic Heavy-Ion Collider, were apocalypses in a bottle, too. It’s not clear why these defenders against science think a US federal court in Hawaii should have jurisdiction over CERN (the tenuous jurisdictional thread relies on the magnets for the collider, which are produced by Illinois-based Fermilab), nor why they think this particle collider will destroy all matter in the universe when the previous fifty years of such experiments have failed to do so. Hopefully, the courts will throw them out on their ears. 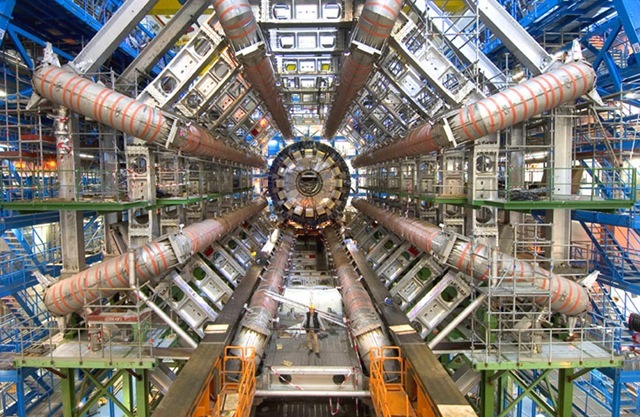 These rights and claims are regarding the FACT(s) that NASA and other u.s. agencies, including but not limited to; the national science foundation.,etc, has fraudulently claimed and/or channeled money into CERN based on the FACT that the temperature of space is in FACT not FACT but theoretical based data…Many who oppose CERN and the Large Hadron Collider argue that the machine IS going to destroy the world when it goes online this May 2008. Evidence on this page substantiates opponents arguments based on FACTS not mere ‘theory’…Physicists at RHIC in Brookhaven, New York have already potentially imposed the death sentence on us all by creating a blackhole in 2005…Are we going to sit idly by while similar experimentation/negligence is allowed to continue? This entry was posted on March 28, 2008 at 2:10 pm	and is filed under law, Science. Tagged: apocalypse, CERN, crazy, Large Hadron Collider, lawsuits, particle collider, physics. You can follow any responses to this entry through the RSS 2.0 feed. You can leave a response, or trackback from your own site. hildegarde (also a story about a double agent living in France…) was banned from LHCConcerns. It became clear that hildegarde was ‘created’ to discredit the Safety movement. False analogy. The energy of the neutrons (mosquitos) that triggered the exponential process (E=mc2) in the TRINITY ATOM BOMB TEST 1945 in the New Mexico Desert was many orders of magnitude less than this, but STARTED AN EXPONENTIALLY INCREASING PROCESS (E=mc2)…During the short time the U235 is explosively brought to a supercritical state (E=mc2), EVEN ONE SLOW NEUTRON (mosquito) causing (E=mc2)fission is sufficient. It’s not the ‘M A S S’ (mosquito) involved, it’s; the ‘C A T A L Y T I C’ (E=mc2) effect of these sub-atomic explosions at dangerously high energy levels, not ‘just’ the effect on the particles themselves. This is the biggest scary thing in history to protest about. These scientist freaks are threatening every single man, woman and child on the planet with death. They are threatening extinction to every life form and creature on earth. Can someone save us from these madmen please. We only have nine days left! The sceintists should be arrested , they are terrorists threatening oblivion and mass destruction on all the worlds citizens. They are worse than Al Qaeda!